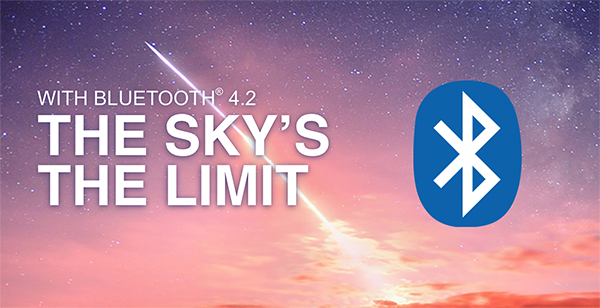 We’ve seen and heard about Bluetooth 4.0 and 4.1 for a while now, but an updated 4.2 version has been announced. The announcement comes in from the Bluetooth Special Interest Group (SIG) and as expected, will be introducing a host of new features alongside speed and privacy enhancements to the existing technology. One of the key features of the updated Bluetooth spec. version 4.2 would be support for direct Internet access, marking some truly new ways in which the chip could be used as it opens up newer possibilities. The technology will be making use of Bluetooth over Internet Protocol version 6 (IPv6). According to SIG, as Bluetooth beacons and Apple’s iBeacons expand their coverage, such an experience will become a standard in public spaces, therefore demanding increased privacy solutions. The SIG says that the new privacy features will allow users to take control of their device by allotting permission to certain devices while declining others, making it impossible for “eavesdroppers” to track your device. In addition to all these nifty features, one subtle but much welcomed improvement is the refined power efficiency, to help save more energy on your mobile device. We can’t say for sure by how much, but this is one area Bluetooth needs to improve in as far as mobile devices are concerned. 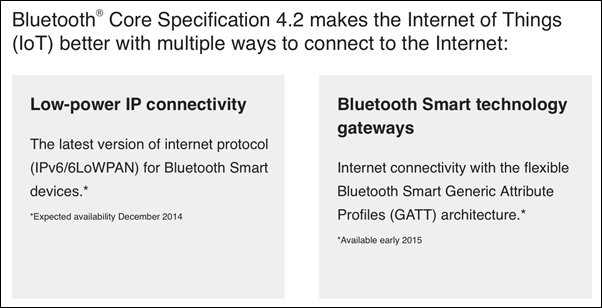 Apparently, some features such as ‘Privacy’ will be available as firmware updates to existing Bluetooth version 4.0 hardware – where it could be updated to Bluetooth 4.1 specification with a software update. However, higher data transfer and increased packet size could require new hardware. Let’s just hope Bluetooth 4.2 makes it to our next smartphone. Bluetooth died when Wi-Fi sharing became possible. And what about bluetooth accesories?! All sounds nice and cool. Unless you own an iPhone (I do btw). I don’t want Wifi for my handsfree, thankyouverymuch. Uh-huh… and that’s why my iPhone, my iPhone playlists, my radar detector, and Waze all connect to my car via Bluetooth. Go on dreaming.